Malcolm has loved dogs since he was quite small. Then one day we met a puppy at the park that was rather nippy and that experience caused Malcolm to have a love/hate relationship with dogs. He would, without fail, desperately want to touch any dog we saw. But if the dog looked at him or got their head close to him he'd scream and run away. I am not a fan of dogs. Or pets of any kind. Childhood experiences had left me somewhat afraid of large dogs. My dislike was compounded in Scotland when I was staying with a woman who had a couple dogs. Our little group was sitting there chatting with her and she kept petting the dogs and then sticking her hand in her mouth (hair or something in her mouth), then would go right back to petting the dogs. It was torture to watch. And ever since then if I pet an animal I would feel uncomfortable until I could wash or sanitize my hands. Pets are dirty and smelly and generally make me shudder. But I set all that aside over the past year and have pet innumerable dogs in an effort to help Malcolm get over the fears he had developed around dogs. (You'd better take extra good care of me when I'm old, kid!) Anyway, he's been making huge progress of late. Over the summer we ran into some pugs at the beach. Oh, did he love those dogs. He was giggling and squealing with glee. He was so, so sad when we and they had to move on, in opposite directions. 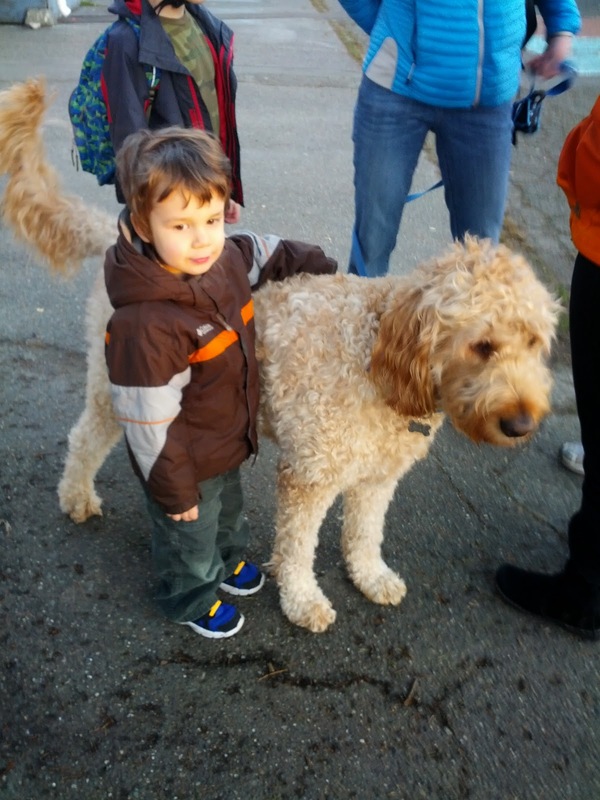 And all last year he had a large dog, Milo, that he'd see on the playground after school that he always wanted to say hi to. Usually he'd run off terrified before getting very close. But myself, the owner, and other kids eventually got him to pet the dog a couple of times. (Milo is, thankfully, an extremely mild-mannered dog.) By a few weeks ago he was happily petting Milo, but still scared if Milo looked at him. Today he happily touched Milo's nose and paw. He loved having Milo's tail wag on him, which would have freaked him out last year (and decided Milo needed some help from him with the wagging). And if Milo moved somewhere, Malcolm moved right along with him. I almost feel bad for Malcolm that he'll have to wait until he's grown and got his own place to get a dog. We had dogs growing up, but they were NEVER allowed in the house (on super cold days, they could come into the garage, but that was as good as it got for them) and we ALWAYS washed our hands the second we were done playing with them. I find myself pretty grossed out by pets in peoples' homes now. I used to be sad that Craig was allergic to cats and dogs, and now I'm glad for the excuse not to bother with them. That was actually one of the things I really liked about our chickens-- they were SUPPOSED to be outside! Phew! Glad I'm not the only one! Ryan grew up with cats and doesn't understand my visceral reaction to them. I've sometimes wished I was allergic because people seem a lot more understanding if you have that as an excuse.